Born in Graz, Austria, Marx according to the website www.joseph-marx.org was during World War 2 the most frequently performed composer in Austria. Marx’s reputation rests mainly on some 150 songs in the late-Romantic style that he wrote whilst still in his twenties. His music has enjoyed quite a change of fortune as Marx’s name is not even mentioned in most music books - try Mark Morris’s ‘A Guide to 20th-Century Composers’. Only recently has a handful of Marx recordings appeared in the catalogue. By comparison the star still shines bright on Marx’s younger contemporary and friend Erich Korngold. A child prodigy born in what is now the Czech Republic, Korngold found fame and fortune writing Academy Award-winning film scores for the Hollywood studios during the heyday of the silver screen. His music has been undergoing a resurgence and is becoming increasingly well represented both on disc and in the concert/recital hall. Twice already this year I have attended concerts that have included Korngold’s Violin Concerto. The first work on the present release is Marx’s Klavierquartett in Form einer Rhapsodie (Piano Quartet in rhapsodic form) for piano, violin, viola and cello. It was completed in 1911 when Marx was aged around 29. The same year he wrote two further works for piano quartet - a Scherzo in D minor and a Ballade in A minor. I know that Goldmark and Reger had recently written piano quartets although I’m not sure of the inspiration for this sudden interest in the piano quartet medium. 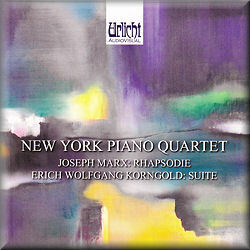 We are told that the performers on this release, the New York Piano Quartet, gave the American première of the Rhapsodie which it seems was at Washington, DC in 2010. Cast in four continuous sections the score of the Rhapsodie for Piano Quartet with the exception of the opening section marked Mäßig contains only bar numbers. The work comes across as one gigantic swathe of intense and squally outbursts of Romantic passion. This contrasts with the second section with its sense of yearning. The introduction to the third section has an attractive extended piano part splendidly played by Linda Hall. Korngold’s Suite for piano left hand, two violins and cello from 1930 was written for Austrian pianist Paul Wittgenstein who had lost his right hand in the Great War. This is one of a number of works that Wittgenstein commissioned for his own use. There’s a video clip of the eminent American pianist Leon Fleisher describing the score as “an amazing work, by an amazing composer.” Cast in five sections the Präludium und Fuge begins with an extended introduction for solo piano. This is followed by an abundance of blustery and exciting writing. Evoking a haunted ballroom the Waltz section could easily have come from the pen of a wistful Richard Strauss. The central section, marked Groteske is vibrant and at times witty. A mood of melancholic yearning at 3:22-6:45 is followed by stormy, rather jagged writing. The Lied alternates calm and emotional intensity while the Finale, with its solo cello introduction, is highly melodic. Fleisher felt that the Präludium und Fuge; Groteske and Rondo: Finale movements were strongly evocative of the scores to Korngold’s swashbuckling Errol Flynn adventure movies. In both the Marx and Korngold I was overall extremely disappointed by the string playing. This, I found not at all unified and also beset with intonation problems. I had to stop listening to the Rondo: Finale (track 9) of the Korngold Suite as I found it excruciating. The sound is generally unsatisfactory being rather congested, a touch cloudy and with an unsympathetic balance. These attractive late-Romantic scores are certainly worth hearing but deserve to be recorded with much improved playing and more satisfactory sonics.